Not to be confused with the Dolly Varden Trout, aka Salvelinus Malma Malma. Nope. Two different fish for sure. Dolly Varden: Anadromous (salt and fresh water). Coast of the North Pacific along the Puget Sound and the Alaskan Peninsula into the Aleutian Islands eastern areas. Also along the Bering Sea, Arctic Sea to the MacKenzie River. Bull Trout: Strictly a fresh water fish. From the Yukon Territory to Nevada, and east of the Continental Divide in the Canadian province of Alberta. Always in mountainous lakes, pools, and streams that run cold and deep. There, now we have it. If it weren't for the DV being bi-aquatic, the mistake wouldn't even be made. Also the Bull Trout has an enlarged head and mouth, hence the name. Well, I just told you above where they call home, but I can reiterate a bit. 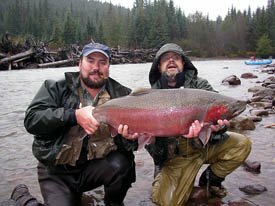 The Bull Trout is a strictly freshwater fish found in deep pools and lakes in mountain regions from the Yukon Territory all the way down to northern Nevada. Also prevalent in Alberta east of the Divide. Size runs to about 45' long (WOW! ), weighing somewhere in the area of 32 pounds. These fish will spawn in late August thru early November, with the eggs hatching from 7 to 8 months later. The water needs to be below 46 degrees Fahrenheit for the hatch to occur. As young fry or hatchlings, these fish start a diet of plankton and benthos (organic material from the bottom), and as they grow bigger and mature, they turn their sights mainly on other fishes. The bull is a voracious eater and will feed whenever the opportunity presents itself. They have been observed feeding heavily on salmon eggs, young fry of other species, and other fish smaller than themselves. So, yeah, they have a bit of a reputation as a "bully" and no, that is NOT where the name came from. These tasty little morsels can be enjoyed in any version of your favorite trout recipe. Stuff it, fry it, bake it, broil it, poach it, or whatever. I am sure you will enjoy this delicious treat from Mother Nature. Don't forget the wine, butter and fresh veggies, folks! One of my favorite trout recipes is very simple. Take the fillet, drag it through some milk, then some seasoned flour, and toss it in a hot pan. Fry it up with a little butter and white wine, maybe some onions and sweet bell peppers. Served with rice. It can't be beat for ease and flavor.